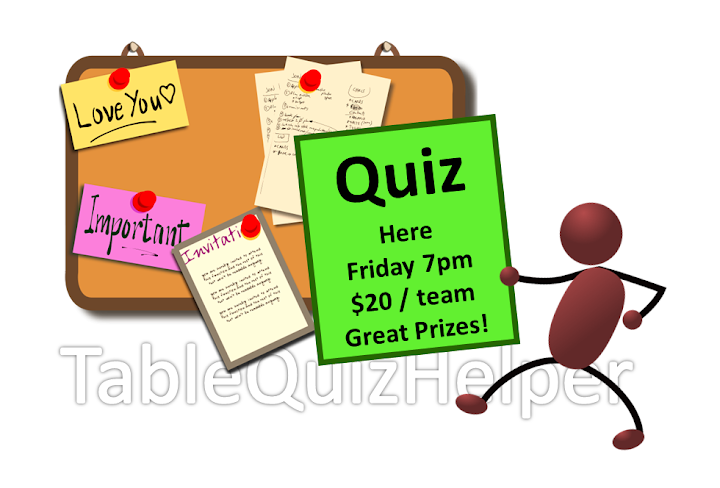 A poster can be a very useful way to promote your table quiz: done well, it is an eye-catching graphic which you can put up on-line (on your website, Facebook page, forums etc) and in lots of noticeboards and public places. But a poster can also be a lot of work and take a lot of time: generally you need to start work on it at least three weeks before you need to start displaying it - and for most events, you want your poster to be on display for 2-3 weeks before the event. So that means your poster work needs to start almost 2 months before your event. 3) Plan how and where you want to use the posers, in general terms. 4) Get the design approved, and get an electronic copy of it. 7) Get the copies of the poster distributed to places where your target participants will see them - online or or physical noticeboards. Steps 5 and 6 may be optional, if you only plan to use your poster on-line. Other than that, you need to make plans for how to do all the steps - there is no point designing a poster that no one sees! 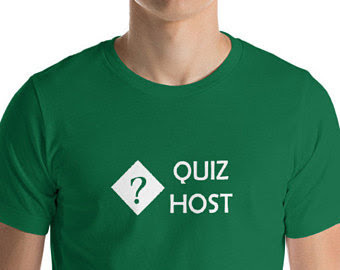 The first step in planning a poster for a quiz-night is to plan the quiz-night itself: you need to know what it's called, who's it for, where, when, how much, how to register). Is there an existing "house style" which is "always used for your organisation's promotional materials? Are there any particular colours which must be used - or not used. Are there official logos that need to be included? These may be for your organisation, one that you are raising funds for, and also any companies or organisations that are sponsoring the quiz. If there are, then you need to get a high-quality graphic file of these as soon as you can. Is it just a poster, or do you need a co-ordinated design that will also be used on flyers, tickets, Facebook events, and the website? What size(s) will it be printed in? If it's going onto A5 or A6 paper, or onto large sizes to for billboards that people drive past, then there is less scope for small-print details. Will it be full-colour or black and white? What type of printer will you use? What type of paper / card will it be printed on? (If you're using an inkjet printer, then you probably need a simple design, with not too much block colour - you might just use black on a brightly coloured paper). Who needs to approve the poster design before it is printed? It is very important that at least two people look at the poster and double-checks the information before the poster is used anywhere: putting out even a few copies with the wrong information can be hard difficult to correct, as well as wasting funds. Some groups want either the entire committee, or least a sub-committee, to see a draft and sign off on the final design. A graphic file (Photoshop, or whatever tool they use)that you can use if you need to make any changes or to use the same design-elements to create a similar-but-different item (eg flyers, tickets). Grab a marker pen and a piece of paper, and make a few copies of a quick hand-written notice. Or maybe an option somewhere in between. 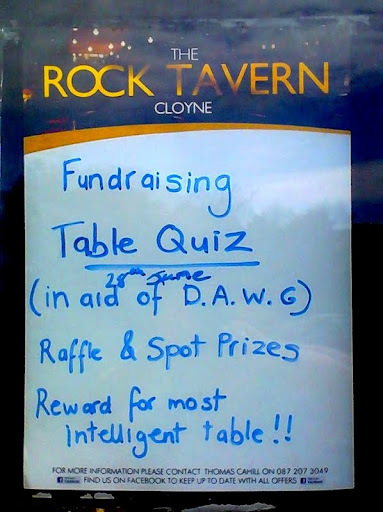 There's no right way of doing this - it's all about matching up your budget, skills and expectations with how important the poster (and other marketing materials like tickets, banners, on-line ads etc) are in promoting for your table-quiz. The quality and professionalism of your promotional poster does a lot to set the "tone" of your event. And there are always mistakes to proof-read for. Having a written or emailed "signed off" copy avoids any later arguments with your designer or printer. And if the quiz is being organised by a committee, it may be good to get everyone to sign-off on the design, or to agree in advance who is responsible for signing off. Once the design is approved, you need to make copies of your poster. Some people do this by emailing copies to their friends, and asking the friends to print them out and put them up anywhere that they can. This isn't recommended, because you don't know how the printouts look - and because you cannot guarantee that anyone will actually do it! Often 80% of people who say that they will help don't actually get around to it. For colour copies, get quotes from several companies: colour printing is expensive, and there can be big price differences. If you need a lot of copies, then it's best to leave the job with the company: that way, they can schedule your printing around the other jobs they are doing. Always find out ahead of time how the you will need to pay for the printing: small local print shops may want to be paid in cash when you collect your printing. If a printing company is sponsoring your quiz by providing free or low-cost printing services, you may need to meet other requirements too, eg having the printing done on their quietest day in the week. Once your poster is ready, you need to put it to work. An easy first step is to add it to your website, share it in Facebook, email it to people, post it in local discussion boards etc. For this, you need a copy of the output file. Make sure the graphihc file you use is small-ish (ideally 100k or less), so that your website loads quickly and you don't email large messages. On the other hand, Facebook prefers photos that are at least 250k, especially. Distributing printed copies takes a little more effort. Where you can realistically get a poster to in the timeframe: visiting fifty poster-locations is going to take several hours, at least. Then, when the poster is available, the person who is responsibly for promoting your qiiz - or a trustworthy volunteer - should take a poster to each place on this list, ask if it's ok to put it up, and then attach it to the wall or noticeboard. Asking permission is very important, because many places remove un-authorized flyers and posters. It's generally not a good idea to just leave a poster that "someone will put up later", or "for the manager to think about", because almost all posters like this get accidentally forgotten about (unless you are good friends with the manager). Choose the days when you distribute posters carefully: if you put them out too early, they will just be covered up by other posters - but if you put them out too close to the event, there will not be enough time for people to see them. Remember that because this is a table quiz, people need time to see the poster / invitation, and then to find a group of people to make up a team. So you might put them out a little earlier than for some other events. Make up a kit of materials for putting up posters: sellotape, blu-tack, drawing pins. Take it with you every time you go out postering. If it's raining, put your posters into a waterproof container. In each location, always ask permission before you put a poster up. Lots of places will simply remove posers that they didn't authorize. If someone says "no", then don't argue. Just say "ok, thanks" and move on. (They may have a policy against posters, or you may be competing with an event they are running, or they may just be having a bad day.) If you argue, or put up a poster anyway, they will most likely take it down as soon as you're gone. Try and make best use of your time, by putting about posters will you're out doing other jobs or messages. if the place is quiet enough, ideally get into conversation with the person working in or supervising the place where you are putting the poster: if they remember you and think it's a good cause, they're likely to chat to other customers about your poster. Or they may even form a quiz team themselves. Look for a good location on each noticeboard, ideally at eye level of the people who might be there. If there are no spaces, look for posters for events that were in the past - it's fine to take down other posters that are out of date. Keep an eye open for places that aren't on your list, but which might be good poster locations - this will make up for the places that say "no" or where there is no space. As you go, keep a list of the places where you were able to put a poster. Look over it later on to spot any important places that you missed. If you can, visit your locations again a week later, to check if any of your posters need to be replaced because they've been covered by other posters etc. Putting up posters in out door public places is called fly-postering. In many places it is now illegal, and organisations that do it may be fined heavily by the local council. In some locations, you will need to go around and take your posters down again after the quiz: if so, make sure you keep a list of places when you are putting the posters out. It's also good to get feedback from quiz-participants and people distributing the posers about how easy they were to understand, and how they compared with other posters on noticeboards etc: this is information that you can use to design a better poster next time you run a quiz.